Is there a role for the artist in the formation of artworks’ value? Sure there is, although her importance in the value formation process has mostly been dismissed in the cultural economics literature. In fact, while the figure of the artist as an individual and as a worker has been widely studied, her role as one of the most important agents in the value formation process has almost been neglected, despite her being the actual creator of the artwork. So far many scholars have focused on the importance of the artworks’ value in the art market and also provided suggestions as to how to decompose this value into more market-related sides (such as the so-called economic value) and non-market values (such as cultural value). While the economic value can be easily proxied by the artwork’s price – in case the artwork has already been exchanged in the market – the cultural value evaluation can be quite difficult, given its multi-faceted feature. Different views have been proposed regarding the decomposition of the cultural value of a cultural good (and thus, the artwork’s). The coexistence of different values in the same good makes its evaluation a difficult task, in fact various evaluation methods have been developed, which take into consideration all aspects of value, or, at least, as many as possible. However, in order to properly evaluate the value of an artwork, it is essential that we understand the relationship between its components. Different points of view on this topic have been proposed in the literature, ranging from the idea that economic value encompasses cultural value and hence the former is the only one that should be taken into consideration, to the idea that economic value and cultural value operate in two separate “sub-markets”, with different mechanisms of formation, and the latter influencing the former. Figure 1 contains a graphical representation of what we think is the relationship between economic and cultural value and how the latter can be decomposed. The cultural value of an artwork can be evaluated without knowing its economic value, by considering all of its components. At the same time, the economic value can be evaluated without knowing the cultural value, although in this case the evaluation would not be accurate, since it would not take into consideration all information concerning the non-market sides of value. Although this reasoning still may be valid, it leaves no room for the most important agent in the art market, the creator of the exchanged goods: the artist. Does the art market react to artist-related events, such as death or public appearances? To a great extent this is actually the case, since those kinds of events affect the artist’s fame and, consequently, the price and economic value of the artworks. However, fame is only one side of the story, since also talent plays an essential role in the formation of the artworks’ value. In fact, talent has a direct effect on the artworks’ value, which is prior to any economic evaluation, since it affects the artwork’s cultural value through the direct effect that talent has on some of the components of cultural value (see Fig. 1), such as art-technical value and aesthetic value. 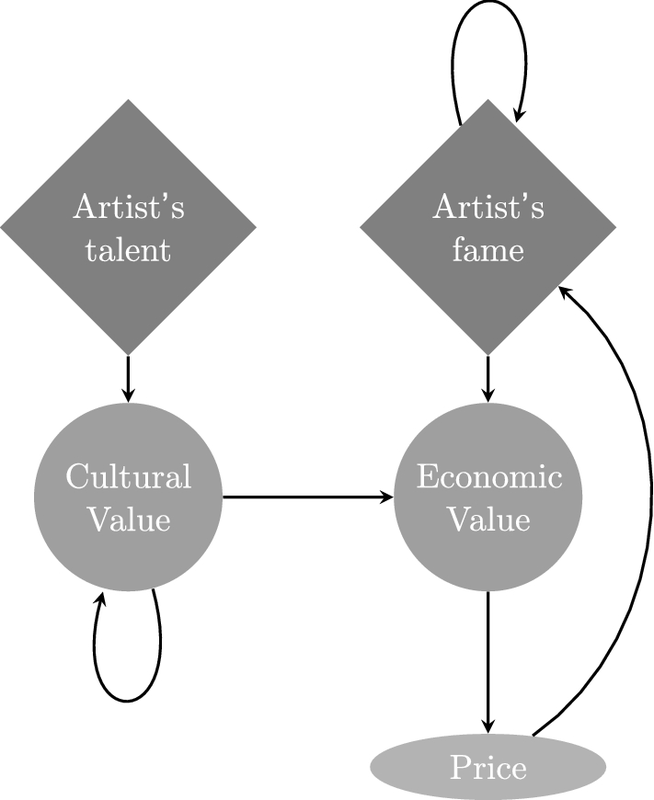 If the relationship between cultural and economic value is like the one we depicted, this implies that the artist’s talent has an effect also on the economic value of her artworks. The value formation process we described is reported in Figure 2. Notice that we are not reporting the influence of other agents operating in the art market, such as galleries, experts, and auction houses, even though they all have a role in the formation of cultural value and may actually change the reputation of the artists through their exposition/auction catalog choices. These effects are implicitly represented in the loops that go from cultural value to cultural value, fame to fame, and price to fame. In our paper we review the burgeoning literature on the topic above and present a sketch of a model to explain the formation process of artworks’ value, focusing primarily on the artist’s role. The benchmark presented can be used as a baseline to build a dynamic model of the value formation process and enhance understanding of how the art market works. 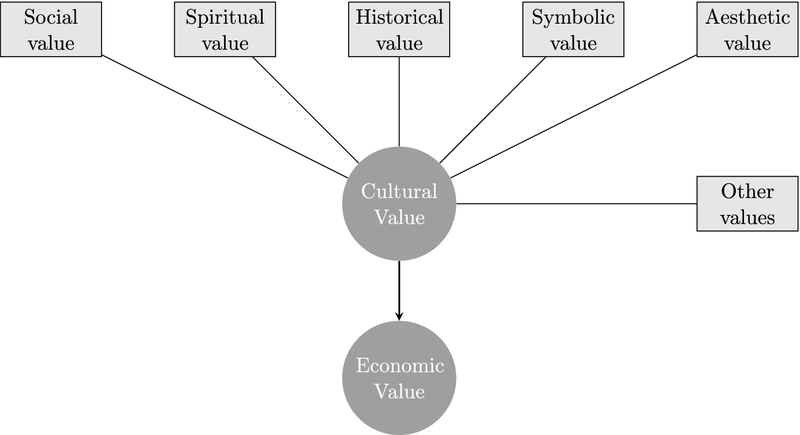 Angelini F. and Castellani M., (2018), “Cultural and economic value: a critical review”, Journal of Cultural Economics, https://doi.org/10.1007/s10824-018-9334-4.